Justin Bieber and Hailey Bieber's road to marriage began more than three years ago. The two have known each other since they were teens but sparked romance rumors in late 2014. They dated on and off and were even rumored to be engaged in 2015, following a bogus news report. Bieber and Baldwin's romance sizzled over the 2016 New Year's holiday, when they vacationed in the Caribbean. Weeks later, they spent Super Bowl 50 Weekend together. During the next two years, the two spent time apart dating other people; Last fall, Bieber rekindled his relationship with Selena Gomez for a while, while Baldwin and Shawn Mendes sparked romance rumors. 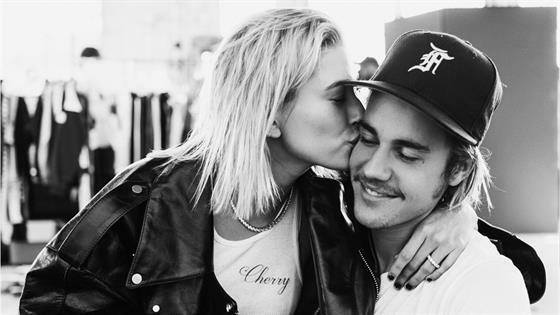 Bieber and Baldwin reignited their own flame in June 2018, and have since traveled together to places like Miami and New York City, where he proposed to her the following month. On Thursday, September 13, E! News learned they had a marriage ceremony at a New York City courthouse. The two plan on tying the knot in another ceremony in front of family, a source said. Check out Justin Bieber and Hailey Baldwin's road to marriage. Hailey and her dad Stephen Baldwin join Justin at the premiere of his biopic Never Say Never in New York City. Hailey is 14 and Justin is 16. Hailey celebrates her 18th birthday with Justin and other friends, such as Kylie Jenner and Kendall Jenner. No romance rumors yet. Hailey and Justin appear together in Instagram pics, sparking romance rumors. "I've known him since I was so young—since I was like 13—and we've just been good friends over the years," Hailey tells E! News at the time. "We have just stayed close and there's nothing more to it than that." December 2014: "People Are Crazy"
"People are crazy. I'm super single and this is my good friend u would know otherwise," Justin says, alongside a photo of him and Hailey sitting in a car. The two are spotted out dining in New York and New Jersey and also hang out at his residence. Justin celebrates his 21st birthday with Hailey and other friends in the Caribbean. Selena, who at this point had dated Justin on and off until 2014, shocks fans by liking a video he posts that shows him hula-hooping with Hailey at Target. Friendly exes? Justin and Hailey spark engagement rumors thanks to a bogus news story, which also spurred the hashtag #CongratsJustinandHailey. The two are spotted walking together in Beverly Hills. Justin and Hailey get cozy while celebrating the holiday in Anguilla. January 2016: Trouble in Paradise? Justin and Hailey don't look too happy in paparazzi photos from their New Year's trip to the Caribbean. January 2016: False Alarm..and PDA Alert! The two share a passionate kiss on a night out. January 2016: Just a Fling? A source tells E! News that Justin and Hailey's relationship is "more of a just a fling," adding, "They have a lot of fun together but don't know what will happen now. They aren't thinking too much about it and are just having fun." The two reunite in San Francisco for Super Bowl 50 Weekend. "They are not an exclusive couple even though Hailey has made it clear that's what she wants from Bieber," a source tells E! News. "They spent the night together Saturday." "All of Bieber's friends like Hailey and would like to see them together," the source adds. "They are dating. They both had a great time this weekend with each other." January 2016: Braids and a "Tight Relationship"
"Hailey made me get corn rows like an absolute douche bag, these will be off tomorrow trust me Danny," Justin says, showing off a new look during their vacation. Meanwhile, a source tells E! News, "Hailey and Justin have a very tight relationship. They both are very close with each other's families and care very deeply about each other. Hailey's family has been there and supported Justin through his transition so Justin has a strong respect for them." "He loves Hailey as a friend and considers her one of his best friends," the source adds. "They both also have a strong attraction towards each other and this trip they have been having fun with their families, but also had some alone time. Hailey and Justin like to party and let loose and this romantic connection has always been there." February 2016: "Someone I Really Love"
Justin tells GQ magazine that Hailey is "someone I really love," adding, "We spend a lot of time together." February 2016: "We Are Not an Exclusive Couple"
"We are not an exclusive couple. He's about to go on tour," Hailey tells E! News about Justin after his GQ article comes out. "Relationships at this age are already complicated, but I don't really like to talk about it because it's between me and him." March 2016: Hailey Is "Not Dating"
"Hailey is not dating anyone at this time, just hanging out with her friends and working," a source tells E! News. "Bieber and Hailey are still close friends, but he is on tour and extremely busy now, so they have not seen each other that much. Bieber and Hailey love each other but have a good understanding where they both stand at the moment." April 2016: "It's Hard to Date Somebody in This Industry"
"I don't want attention out of dating somebody," Hailey tells Marie Claire. "Texts started coming through, crazy phone calls...it's hard to date somebody in this industry. You have to have really thick skin and be very strong. You have to focus on the person and nothing else." Justin and Selena rekindle their romance. E! News learns Hailey is dating the singer. The two call it quits over their romance again. Late March 2018: Church Reunion? Justin and Hailey attend the same church service together. Hailey and the singer make their joint red carpet debut at the prestigious celebrity event, fueling romance rumors. They post photos of each other on Instagram. Hailey tells the Times UK that she and Shawn "hang out and he's super-lovely and a very, very nice young gentleman," adding, "But I am single." She also says, "Justin and I were friends for a long time. I met him when I was really young and he was one of my best friends. Everybody knows that at a certain point in time that turned into something else, but that just happens when you're 18, 19. It was what it was. We went through a long period of time when we weren't friends. We didn't speak for quite some time and there was a lot of weirdness that went on. We've moved past that." He tells E! News, "I am single. The Met Ball was such an incredible experience for me. It was just overwhelming in the most incredible way. I was so lucky for my first time going there to be able to go with someone like Hailey because she's such a vet and I really admire people like her because of how outgoing she is in such an overwhelming experience." Justin and Hailey reunite in Miami, sparking romance rumors again. Justin and Hailey pack on the PDA in New York City, which is captured on video. "I don't know if they're dating or not," Shawn Mendes tells Canada's eTalk, adding, "I love them both. They're both really awesome people." Justin and Hailey get cozy on the set of a music video in Los Angeles. Hailey deletes photos of Shawn from her Instagram. He keeps his pics of the two on his own page. Justin and Hailey celebrate the holiday together in the Hamptons. Justin and Hailey head back to New York City for a romantic weekend. Justin proposed to Hailey during a trip to the Bahamas on July 7, 2018, several weeks after they rekindled their romance. "Was gonna wait a while to say anything but word travels fast, listen plain and simple Hailey I am soooo in love with everything about you! So committed to spending my life getting to know every single part of you loving you patiently and kindLY. I promise to lead our family with honor and integrity letting Jesus through his Holy Spirit guide us in everything we do and every decision we make," he shared with several photos. "My heart is COMPLETELY and FULLY YOURS and I will ALWAYS put you first! You are the love of my life Hailey Baldwin and I wouldn't want to spend it with anybody else." The adorable pair returned from their romantic Bahamas getaway and tried to get back to their normal routine. They were all smiles as they went to dinner at Cecconi's restaurant in New York City. Soon after their engagement announcement, the Grammy winner showed love for his leading lady by posting a steamy shot of the pair kissing in a hot tub. On the same day Justin posted a PDA picture to his Instagram, Hailey shared her own picture of the happy couple. In the shot, the newly engaged pair is seen walking up the steps of a private jet. The couple is blinged out, wearing matching diamond watches alongside Hailey's massive diamond engagement ring. The two traveled back to Miami, this time as an engaged couple. When they're together, they let out their silly side. The duo is often spotted exploring NYC together, laughing and enjoying each other's company. Fans were concerned after photos surfaced of the singer looking visibly upset next to his fiancée. However, Justin confirmed that there's nothing to worry about. In a video obtained by TMZ, he told fans that, "You've got good days and you got bad days. It's not real if it doesn't have any bad days." The model invited her fiancé to John Elliot's presentation during New York Fashion Week, marking their first fashion show as an engaged couple. They were joined in the front row by LeBron James, Whoopi Goldberg and Kendall Jenner's former flame Ben Simmons. The two grab some java as they head to the airport in NYC.